Kathutet is a Dremora found in Mankar Camoran's Paradise, in the Savage Garden. 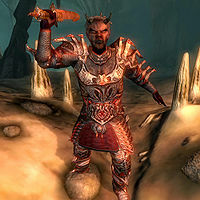 Like all Dremora he despises mortals, but respects your fighting skills shown during Breaking the Siege of Kvatch. He notes that some of his kin were there, and defeated by you. He seems to harbor a great deal of resentment for being forced to serve as one of Camoran's watchdogs, which may be why he is willing to aid you on your quest to slay Camoran... for a price, of course. Whether you choose to help Kathutet or kill him, you will get the Bands of the Chosen from him during the related quest. He wears a near complete set of Dremora Kynval armor, minus the helm and gauntlets. In combat he relies on the Purging Flame longsword. He also carries three leveled potions. Before he speaks to you, he will wait in ambush outside the entrance to the Forbidden Grotto. If you submit to his service he will be found wandering inside the Grotto. As a Dremora, Kathutet possesses the relevant abilities. When Kathutet greets you for the first time, he will say: "You destroyed the Sigil Tower at Ganonah. My kin say you fought well." Ganonah? I've never heard of it. "Our clan sacked your city of Kvatch... a trifling task fit for scamps. Your swift retribution earned you much respect among my people. We had not expected that a mortal would act with such resolution and honor. It is no dishonor for us to speak." I have nothing to say to you. "Talk or not as you choose. But you will listen." I seek Mankar Camoran. "You speak directly like one of my people almost. I'm glad I did not kill you immediately." I'm going to kill you. "Like all mortals, you talk when you should listen. You will have your chance for battle, if you wish it." What do you want, then? "There is one way out of the Garden. I guard that path. You will travel that path, and it will bring me honor to defeat you. But you shamed my kin at Ganonah. To bring you into my service... that would also bring me honor. So I offer you a choice. Would you confront me in battle? Or offer me service?" (if you have already freed Anaxes) "I find myself in your debt and this irks me. I am honor bound to repay my debt to you. If you will it. There is one path from the Savage Garden. I guard that path. In return for your service, I offer you the key to that path. If you refuse a gift from an enemy, you may choose instead to prove your honor upon me in combat. By giving you this choice -- gift or battle -- I discharge my debt to you." I have some questions. "You are impertinent, mortal. I did not offer to answer questions." I choose battle. "Your mind follows the simple path, the choice of an animal. But you have courage, at least. You will fail, mortal, and then where will you be? Dead. And nothing." I choose service. "An intriguing choice. And I have a task in mind that will test your wit, and your loyalty. The rabble of the Savage Garden have imprisoned the Xivilai Anaxes. I consider his humiliation a fitting punishment. However, his shame attaches to me, and though the matter is too small for my attention, it is not too small for one of my servants. Free Xivilai Anaxes, and I shall reward you with the key to the Forbidden Grotto... the Bands of the Chosen." I'll take this key from your corpse. "Your mind follows the simple path ... the choice of an animal. You see an enemy and you attack it, unthinking. But you have courage, at least. To slay a bold animal like you is not without glory." Free the Xivilai? "Mankar Camoran's chattels, the unmortals that swarm here in the Savage Garden, their proper role is to test themselves in unceasing combat. But, being no true immortals, they are without honor or courage, and shy from battle. However, by some trick, they trapped one of my agents, the Xivilai Anaxes, in a cave. They show initiative, and Anaxes doubtless deserves humiliation, but I cannot permit this to continue. Do me the service of freeing Anaxes, and I will reward you with the Bands of the Chosen and passage to the Forbidden Grotto. Anaxes "Mankar Camoran's chattels trapped the Xivilai Anaxes in a cave. He is their Lord, and thus they mock him and me. Free Anaxes and restore order to the Garden, and you shall have the Bands of the Chosen." Bands of the Chosen "At Mankar Camoran's command, a favored few are given the Bands of the Chosen and may leave the Savage Garden. You cannot pass through the door to the Forbidden Grotto unless you wear the Bands." Forbidden Grotto "The one path from the Savage Garden is through the Forbidden Grotto. Only those few wearing the Bands of the Chosen are allowed to leave the Garden." If you speak to him again while you are in his service and have not freed Anaxes yet: "You test my patience, mortal. You are in my service. I expect my orders to be carried out." If Anaxes dies, but not by the player's hand: "Since the Xivilai Anaxes, lord of the Savage Garden, has fallen, you must now face me in battle. There is but one path forward, and I hold the key." If the player kills Anaxes: "You cannot deceive me. Anaxes has fallen. Now I must restore order to the Garden myself, and this angers me." Once you complete his task: "Anaxes is free. Order is restored to the Savage Garden. You have served me well. In return for your service, I will give you the key to the Forbidden Grotto, if you still wish it." Give me this key. "Take these Bands of the Chosen, then. Wear them, or you cannot enter the Forbidden Grotto, the only way out of the Eternal Garden. Honor, and pride, bids me tell you: none can escape the Forbidden Grotto. There you will be the charge of my kynsman, Orthe." I'll take this key from your corpse. "You are unlike any other mortal I have encountered. You serve me, and then you spurn the reward for your service. Come. As an equal, I shall grace your name and corpse with honor." When Eldamil is pretending to interrogate you in the cages and Orthe interrupts, Eldamil will lie to him, saying "This prisoner was sent in by Kathutet for questioning. I was about to begin." Kathutet also appears in ESO. This page was last modified on 1 January 2019, at 17:16.